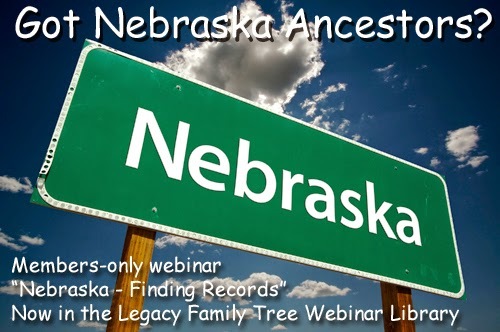 If you have ancestors that settled in or passed through the state of Nebraska, you need to watch our newest pre-recorded webinar, Nebraska: Finding Records by the President of the Nebraska State Genealogical Society, Ruby Coleman. This is the second in the series on finding your Nebraska ancestors. Got Nebraska ancestors? In this webinar, Ruby Coleman will dive further into the available records to help you in your quest. Nebraska records begin in approximately 1854 and are primarily kept on a county level. This webinar will present information about the Nebraska State Historical Society’s online resources and collections. Other areas reviewed are the Nebraska State Surveyor’s Office records and records at the Civil War Veterans Museum. Plan your Nebraska research by using web sites that contain indexes and information.